Every condo rental has its own grill, perfect for a family cook out. White adobe and Spanish tiling give the Palms their distinct character. There's enough room for kids to play and adults to relax. Admire the tropical gardens and soak in the sunset from the pool. The only thing you'll hear are tropical birds and the occasional drive of the golf ball. Breathtaking vistas of the shimmering ocean mix with the emerald links of Wailea Golf Club. The Mediterranean-Style Palms at Wailea Maui by Outrigger is located within the world-famous Wailea Resort and has everything that you need for a peaceful family retreat. Palms at Wailea Maui by Outrigger is set on a hill overlooking the ocean and is adjacent to the World-Class Wailea Golf Club. Make a pit stop at your condo to get changed into swimsuits – don’t bother unpacking, there will be plenty of time for that later – spray everyone head-to-toe in sunblock and get ready to hit the outdoor whale-shaped pool. Enjoy a relaxing swim or lounge poolside and admire the resort’s beautiful grounds with well-manicured lawns while you catch up with the latest celebrity gossip in this week’s People magazine. The resort’s full-service concierge will be happy to assist you with area recommendations. Individually decorated one- to two-bedroom condos sleep four to six guests and have garden or ocean views. All condos have full kitchens because sometimes a mini-fridge just doesn’t cut it. Bring the kids along to the nearby Safeway to make sure that no one’s favorites are forgotten. After returning from the store, take advantage of the bbq grill on your private furnished lanai. Make a batch of your famous barbecue chicken (and throw a few hot dogs on there for the picky eaters in the bunch). In-suite entertainment includes a Cable TV with DVD player. Bring favorite movies from home, gather everyone on the couch and get ready to be entertained. Show off your multi-tasking skills and throw a load of laundry into the in-suite washer/dryer while the movie is playing. For an upgraded condo, book a deluxe one- or two-bedroom. Golf enthusiasts couldn’t have picked a better resort for their vacation. 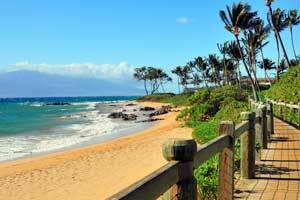 Palms at Wailea Maui by Outrigger is adjacent to the World-Class Wailea Golf Club. Wailea Golf Club features three courses and has been rated among the best golf courses in the U.S. by Golf Digest and Golf Magazine. Wailea’s original golf course, the eighteen-hole Wailea Blue Course, was designed by Arthur Jack Snyder and features a clubhouse and Pro Shop. The Wailea Emerald course features golf for all experience levels. This eighteen-hole, almost seven-thousand-yard course was designed by Robert Trent Jones Jr. The Wailea Gold Course has eighteen-holes, is over seven-thousand yards and was also designed by Robert Trent Jones Jr. If you’re in the mood for retail therapy, head to the Shops at Wailea, just a short drive from the resort. Luxury brands include Gucci, Louis Vuitton, Prada and Tiffany & Co. More affordable brands Banana Republic, GAP, Quicksilver and Billabong are also available. Hungry? Try Tommy Bahama Restaurant & Bar, Ruth’s Chris Steakhouse or Cheeseburger Grille & Tap Room. - Front desk is open 8:00 AM-11:00 PM daily. Guests that are planning to arrive late must contact the property in advance using the information on the booking confirmation. Cribs (infant beds) are available for USD 15.00-20.00 per night.